Once people figured out what was causing the random MacBook shutdown (the heat sink melting through a wire's coating), the solution was easy: electrical tape. Is a used iBook a good buy or a bad idea? Columnists take both sides of the issue. Curiously, the MacBook Pro is a better computer for Microsoft Vista than Sony's high-end Vaio laptop. Go figure! Is a Second-hand iBook Worth Buying? "Is your MacBook shutting down by itself? A German dude came up with a solution to this problem, caused by a heat sensor cable that's too close to the heatsink on the CPU. That heatsink expands when the MacBook gets hot, to the point where it actually touches and melts the insulation on the heat sensor cable, shorting it out and turning off the computer. I installed new RAM and now all I get it a blue screen at startup! My MacBook is getting really hot on the bottom and near the LCD. Is this safe? Should I get that Core Duo Temp program to monitor my MacBook's internal temperature? I was working and my MacBook just went off completely! People keep talking about what week their MacBook was built. How do I find out? I have these shiny spots all over my palm rest and trackpad and I've only had my MacBook a few weeks! My screen flashes brightly the instance I touch the power button sometimes! I can't seem to get my Apple Remote to work with my MacBook! "Having to send your notebook battery back to the manufacturer due to safety concerns can be a pain as far as going mobile with it is concerned, but some user reports are suggesting that it could be a shorter wait than the 4-6 weeks that Apple say customers should wait, and you may end up with a better battery." "With its perpetual quest to squeeze more power into smaller spaces, it was only a matter of time before the portable computing world became unstuck. 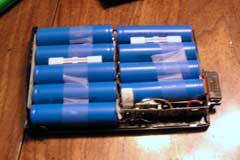 "We've written a few articles recently on the so called exploding batteries and wondered if perhaps it might be a time to reflect on how we ended up in this situation and how or what the answers are. "Cast your minds back to 1998, when Apple launched an ad campaign outlining how much power the Intel chips required, it was called the 'toasted bunny' and featured a fireman putting out a burning Intel production worker. How ironic that both Apple and Dell should today be suffering from the same problems. OK - I hear you saying 'it's the batteries' - well the reason the batteries today need near 'nuclear pile' capability is because of the power drawn from the CPU's and associated components. "Part of the problem is because of the myth perpetuated and funded by Intel that it's all about MHz. This myth has been the bane of PC notebook manufacturers for some time - trying to squeeze more and faster in a smaller box. "We think that its about time the market stepped back and took a bold look at what the consumer needs as opposed to what the marketers at Intel tell them and us what we want." "Have you been wondering just how hot your MacBook Pro can get? Well, friend, you don't need any fancy synthetic benchmarks. The software you need may be downloaded directly to you." "Is everything as good as it seems in Mac land a year later down the road? In this article I'll be taking a look at a 12" G4 iBook read on to find out more about this machine and what I've found. "The 12" iBook G4 (fitted with 1 GB RAM) used for this test was purchased late 2005 for use by a university student. Since its purchase it has been used periodically (best guess 1 in 10 days) for note taking in law lectures. It has always been protected properly and never treated improperly (eg left on the back seat of the car on a 40 degree Celsius day) so everything should be fair to the iBook and the problems pointed out will probably be common with other people's findings. "For readability purposes the article will be broken down into two sections, one highlighting points to look at/note for the chassis and the other for the input aspect (keyboard & touch pad)"
Is a Second Hand iBook Worth Buying? "Now that I'm all settled in on my college campus, I've returned to posting - with quite a few observations on the Macintosh-at-college. So why delay? Let's get right down to it. "There are a surprisingly high number of new Macs here at school (I attend Tufts University). I would guess two in every five computers is a Mac - quite a good ratio for Apple's 7% market share. "A good number of these Macs are MacBooks, but there are also a surprisingly high number of MacBook Pros (I haven't seen a desktop to-date). This really took me by surprise. A MacBook and a MacBook Pro are practically identical computers, save one thing: graphics. I know that 90% of these students will not need the dedicated graphics card of the MacBook Pro. If the student plans on editing video in FCP, playing games, or working in Photoshop/Aperture, I see the Pro as justified. "It perplexed me: why did so many students choose to spend $700-$1000 more than they had to for a college computer?" "Apple may sell over one million notebooks in its current quarter - a new company record, according to Credit Suisse analyst, Robert Semple. "In a research note distributed to clients yesterday, he increased his estimated MacBook shipments to 775,000 units for the September quarter." "Ever since Apple Computer Inc. released its Boot Camp software in April, thus enabling Intel Mac owners to run Windows on their Apple hardware, I've been working with various permutations of Windows on my 17-in. MacBook Pro. There was the Boot Camp-enabled Windows XP installation, the Parallels virtualized version of XP (no reboot needed) and now there's Vista RC1. "When Microsoft Corp. released a beta version of Vista last spring - the final version is due in early 2007 - I was one of those who downloaded it and installed it. At first, all I could do was run it on my year-old Sony Vaio. But that changed a week or two ago when Microsoft released a Prerelease candidate 1 (RC1) of Vista, Build No. 5536, and then, more recently a full-fledged RC1, Version 5600. "I spotted a news item on a Mac site pointing out that with Boot Camp now updated to Version 1.1, and with an RC1 disk in hand, Mac owners could install Vista and get a real taste for what the competition is up to." "My nearly 4-year-old iBook has 4 times died the same death in that time - a logic board failure that, thanks to the magic of AppleCare extended warranty, has been replaced swiftly and at no charge every time. The most recent time, approximately one year ago, I asked about Apple's lemon policy - since the same problem 4 times in under three years seems pretty silly. Their response was that the incidents had been too widely spaced to qualify, but one more in the next year, even after the end of my warranty, would get my laptop replaced with the in-production-at-the-time equivalent. "So, earlier this week, when my laptop died in a familiar fashion, I celebrated a bit - but quietly, and under a veneer of frustration, as I was in the middle of taking notes for a Historic District Commission meeting at the time. I called up AppleCare...."
"Sources deep within Intel tell us everything is going swimmingly for the new MCW cores, but Apple won't produce a laptop with Merom until 2007. The delay is most likely due to a convergence of two things, production and Apple's limited range." "Intel has consistently impressed with its mobile CPUs. The ageing Pentium M processor continues to be a solid foundation for laptops or desktop PCs (like the one in our ultimate quiet PC feature). The successor to the M processor - the Core Duo (codenamed Yonah), is a marvel of engineering that helped push the Centrino brand to new heights. "But what of the recently released Core 2 Duo range of processors, known in tech circles as 'Merom'? Intel says they are up to 20 per cent faster than the current crop of mobile chips, but are they really as good as it makes out? Bored, disillusioned with the world and with a complete lack of anything better to do, we thought we'd break it down for you Crave readers." "...It will go head-to-head with entry-level AMD Turion 64 X2 chips, the sources say." "Did your Apple PowerBook G3 (Pismo or Lombard) battery die? Have you shopped for a replacement battery, and wondered if your trusty PowerBook was worth what it was going to cost for a new battery? Are you handy with a soldering iron and other tools? Are you adventuresome? Would you like to conserve the world's resources by recycling? If so, then you might be interested in this article about my brief adventures with PowerBook G3 batteries." PR: TVBook Pro is a TV card specifically designed for Apple's MacBook Pro. Enjoy live digital TV on your MacBook Pro, record to your hard drive, edit your favourite shows and burn them onto DVDs. 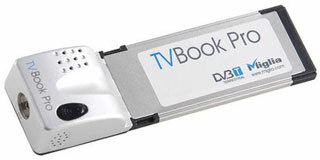 TVBook Pro comes in the form of a nifty Express/34 card integrating a full-featured digital TV tuner. TVBook Pro is as mobile as you are and ships with an amplified antenna that will provide optimum reception when you are on the go. This is a fantastic mobile solution for your digital life, its flexible, portable and extremely stylish. Bundled with Elgato's EyeTV 2, TVBook Pro lets you watch, pause, rewind, skip forward, and record digital terrestrial TV on your MacBook Pro. A truly mobile solution for a truly mobile Mac. 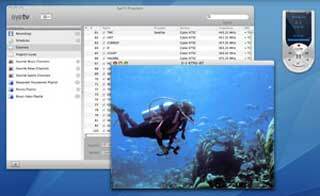 TVBook Pro ships with EyeTV 2 software allowing you to watch digital television on your Mac. Reinvent your TV experience by pausing, rewinding or even skipping forward live TV, ensuring you never miss any part of what you are watching. TVBook Pro supports Digital Terrestrial Television (Freeview in the UK, TNT in France, DVB-T elsewhere), which will give you a perfect picture quality on your MacBook Pro. clutter the room with unsightly cables. So sit back, relax and watch TV without any hassle. TVBook Pro ships with an amplified/active digital antenna. Obviously, an amplified antenna requires power, but you do not really want to carry a power brick with you while you travel. The solution? Let your MacBook Pro power the antenna through a free USB port! TVBook Pro is the only truly mobile TV solution specifically designed for your MacBook Pro. Put your music videos, TV shows, and movie recordings onto your iPod with just one easy click of a button. Thanks to EyeTV 2's MPEG-4 format, you can hook your iPod up to a TV and your EyeTV recordings will look great on both the big and small screens. You can also set your recordings to be exported automatically to your iPod. A great way to enjoy last night's TV show on your way to work! Relax and enjoy the full benefits of watching and recording TV in full screen mode. Navigate channels and menus using your remote control and easily access for media content. EyeTV's built-in editor lets you quickly edit recorded television to save only the parts you want to see again. Remove those boring adverts that only take up additional storage space and keep the bits you really want to enjoy. Simply put a marker on the beginning and another marker on the end of the sequence you wish to remove and click on 'compress'. The result? A full length video without all the unwanted commercial interruption! Thanks to the integrated online TV guide (EPG) from tvtv (Europe) you'll never miss your favourite shows again. Search for shows by actor name, type , or show title, and tvtv will find what you're looking for and tell you when to catch it. With tvtv you can even schedule recordings of shows from a remote site via the Internet or a mobile phone. PR: At Apple Expo Sonnet Technologies announced an expansion to their line of Serial ATA host adapters. Developed for laptop computers, the Tempo SATA Host Adapter for ExpressCard/34 contains two external 300 Mb/s Serial ATA ports. "We set the bar very high for our storage products," states Robert Farnsworth, Sonnet CEO. "The card will enable the laptop user to connect up to 10 drives for high-performance applications such as Final Cut Pro-perfect for working with video in the mobile studio environment." The Tempo SATA Express 34 controller has two external, 3 Gb/s, SATA II ports, and supports up to 10 disk drives (when using port multiplier drive enclosures, like Sonnet's Fusion 500P). 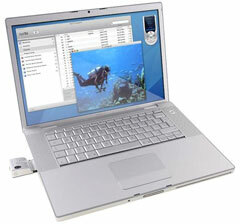 It is compatible with MacBook Pro (15" and 17") and any Windows laptop with an ExpressCard (54) or ExpressCard 34 slot. Unmatched by disk arrays attached by USB 2.0, FireWire, or even FireWire 800, the Tempo SATA Express 34 gives laptops higher disk performance capability than ever. For example, with two external SATA drives attached in a RAID 0 array, the Tempo SATA Express 34 can typically achieve sustained disk write and read speeds of 100 and 110 MB/sec, respectively, which is about three times as fast as USB 2.0 or FireWire connections to the same drive setup. The product supports Windows XP and Mac OS X RAID 0, 1, and 10 and features Spread Spectrum Clocking (SSC) support for compatibility with all SATA drives. The Tempo SATA Express 34 retails for $129.95 and can be found on the Sonnet website or through their many resellers. PR: Introducing the medius laptop carrying case designed for the MacBook 13.3" (Widescreen) and MacBook Pro 15 and 17" Laptops from Apple Computer. The difusi medius case is built using nine panel construction which in turn provides a compact, very spacious interior for carrying all of the items you could possibly want in a carrying case. Designed from the ground up specifically for 13.3" widescreen and 15" or 17" notebooks and tablets PCs. The medius case has built-in "Travel-Safe" protection that provides an extra layer of rugged padding to protect your laptop from the everyday hazards of on-the-go mobility. We have done extensive testing to make sure your laptop is protected from everyday hazards of use. We fully guarantee the quality of our cases with a pretty simple return policy. The medius and maxim cases come with an unprecedented money back guarantee that if you don't absolutely love the your difusi case, return it to us in new condition within 30 days of purchase for a full-refund (excludes shipping and handling costs). The medius and maxim cases have dedicated pockets for everything from office/school papers, personal accessories including your video iPod, cellphones and PDA. The main computer compartment has built-in travel-safe padding which provides drop protection up to five feet on concrete surfaces. All difusi cases provide protection from the hazards of everyday use including compression tests and the five foot drop test onto concrete. Because of the reinforced construction, difusi cases not only look great, they are setting a new standard in case security and reliability. This is one accessory you won't want to hide under your desk. A radical change in case design. The cases have over-padded handles, adjustable leather straps and padded leather zipper pulls for ease of use and comfort. Solid steel mounting and interlocking face plates with rear panel reinforcement to guarantee these cases will last through a lifetime of use. Cases have six built-in compartments including an iPod holder for storing most items in your mobile office. Award winning design for durability and styling. The pocket organizers accommodate full size file folders with up to 300 sheets of paper. Made from the best top grain leather available and durable / lightweight Jacquard Nylon. Color choices with Gray or Black interior fabric choices. Optional interior illumination "Bright" 8 LED, light fixture. Mounting for "Bright" interior lighting and several "difusi only" cases add-ons. Durability includes nylon reinforced exterior double stitching and 4 areas of memory foam padding construction between panels. Comes with a lifetime parts/defect replacement warranty. Custom designed for the MacBook Pro 15-inch. Fits perfectly with most manufacturers' 15-inch laptops. Purchase the Nylon and leather case at an affordable price or move up to the full-leather exterior pro edition. Either way you are getting the best case for your dollar. Material: Soft Black Napa Leather with Gray Jacquard Nylon Interior. Travel-Safe:Is a reinforced frame with shock-absorbing internal-frame and padding. Secured zipper mesh pockets for cables, Etc. Optional Lighting array featuring Eight (8) Ultra-white SMD LED's runs on a single 21/23, 12-Volt battery(Included) with click on/off control. Supported Platforms: Designed for most 15-inch laptops including the MacBook Pro 15, iBook 15-inch and PowerBook 15-inch lines. Designed for most 15-inch laptops including the MacBook Pro 15, iBook 15-inch and PowerBook 15-inch lines. Designed for most 17-inch laptops including the MacBook Pro 17, PowerBook 17-inch and most PC17-inch lines. *Rebates are available to students who must fill out an affidavit of eligibility, provide a copy of a valid current school ID or enrollment documentation to receive a rebate check.